family activity for a fall afternoon. before you fill with your choice of items. greens, berries, and pine cones of all sizes. other fruits of the season. wreath. Hop vines work great too. Again, supplies are available at craft shops. bow, a few sprigs of wheat, or a cluster of fruit. firmly. For a fuller effect, face the flowers in all different directions. could just add a tassel or huge matching bow at the ends of the garland. harvest look. 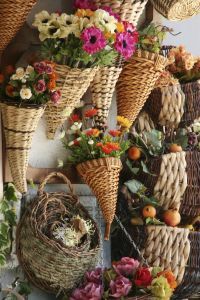 This garland is particularly suited for an outdoor decoration. a bow and hung on the front door. product a work of art that’s truly yours.